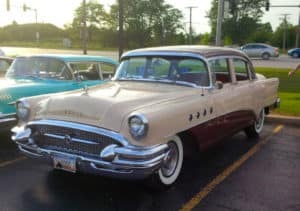 After an absence of several years, Cool Cars Under the Stars is back in Elmhurst! On September 13, this family-friendly event features hot rods and muscle cars, on display from 6-8 p.m. at the corner of Spring and Butterfield roads. At Elmhurst Toyota, we enjoy seeing quality cars of all makes, models, and vintages. We’re looking forward to seeing the lovingly restored and beautifully-maintained classics at Cool Cars Under the Stars. One thing that hot rods and muscle cars have in common is speed. Hot rods may have started out as Ford Model A’s, Model B’s and Model T’s from the late 1920s to the mid 1930s. The story is that during Prohibition, bootleggers needed fast cars to escape from the police. So they stripped down their Fords to make them lighter by removing every exterior part they could, including the fenders and hoods. Next, they made the existing engines more powerful or replaced them with larger ones. These were the first hot rods. Muscle cars are high-performing American vehicles with powerful V8 engines that provide plenty of horsepower. Muscle cars first captured the American imagination in the early 1950s and still hold a special place in car culture. Cars made from the 1950s through the early 1970s are considered to be classics. You’ll see some amazing muscle cars at Cool Cars Under the Stars. All the cars can be seen outside the Elmhurst American Legion Post at the intersection of Spring and Butterfield Roads. Food will be sold, so you can have a snack or dinner while checking out the cars. There are meal specials for just $5. The weather for September 13 is forecast to be a perfectly warm and dry end-of-summer evening, so come out with your family and enjoy it! This event is presented by Elmhurst American Legion Post 187 with support from Community Bank of Elmhurst, the City of Elmhurst and Elmhurst Orthopaedics. September 13, 2018, 6-8 p.m.
Free. Food and beverages are available for purchase. Call 630-833-7800 or visit www.americanlegionthb187.org.